Max was the very first companion puppy we placed through our website. Although we had sold show dogs all over the world, we always knew the buyers, or someone close to them. This was a new experience and somewhat scary. We had never sent a companion puppy this far, nor had we placed a companion puppy without meeting the new owners. We have still never met Max's folks, but feel we are good friends through our joint love of collies and Max in particular. This story shows how special the bond between Collies and humans can be. The following article appears in the September 02, 2002 issue of The Chronicle-Telegram of Elyria, OH, and is Copyright © 2002 by The Chronicle-Telegram. All Rights Reserved. Reproduced with permission. ELYRIA — Socializing with his human friends at recess, the 3-year-old Collie named Max wears a bright yellow tag on his collar. Second-grade teacher Cheryl Landford and Prospect Elementary student Kristen spend time with therapy dog Max. Max helped Kristen overcome her shyness at school. "I am a therapy dog," the tag reads. 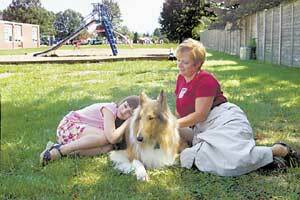 Max, who could easily be mistaken for the television hero Lassie, is well known at Prospect Elementary. Cared for by second-grade teacher Cheryl Landford, Max occasionally comes to school with Landford as a kind of helper for school counselor Laurie Conrad. When Conrad has difficulty getting a child to open up to her about a traumatic experience, she calls on Max. "He's a calming factor for the children," Conrad said. "They can reach out and pet him or brush him. I've had children open up to me about very serious issues that way." Max belongs to Therapy Dogs International. As such, he has passed the American Kennel Club's Canine Good Citizen Test and has shown the right temperament to be a therapy dog. On days Conrad needs him, Landford brings Max to class and keeps him there until Conrad comes to get him. Conrad said she and the student she is working with go to Landford's classroom together to pick up Max. "There's a sense of pride in the children when they get to go to Mrs. Landford's room and pick up the dog," Conrad said. Max is starting his second year working at Prospect. Last year, Landford wrote a proposal for using Max at the school — a service she provides free to the district. "I feel strongly that it is a waste of talent for the dogs to be at home when they can be helping children at Prospect School," Landford wrote in the proposal. "There have been so many times that I wished for a dog to comfort a child during the school day." Therapy dogs are most commonly found providing comfort to patients in hospitals, nursing homes and other institutions. They are starting to catch on in schools, Landford said. Max has helped Conrad calm children with Attention Deficit Disorder, school-related anxiety, or those who have gone through a divorce or family death. "As a counselor in the 21st century, I need a lot of tools to deal with the things I face," Conrad said. "Max is one of those tools." Max is very gentle, but equally protective of the children. If a stranger is nearby, he lets out a growl. Said Landford, "All we have to say is, 'Leave him alone,' and he settles down." Contact Dave Perozek at (440) 329-7119 or dperozek@chronicletelegram.com.